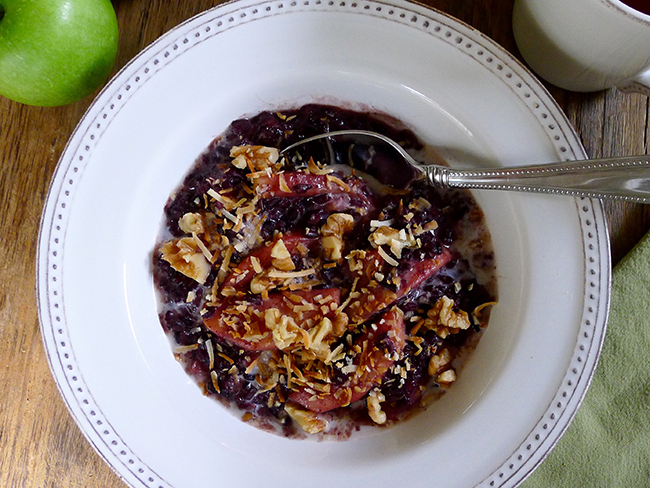 Porridge made from black rice, also called “forbidden rice,” is a creative and delicious alternative to oatmeal. This recipe was inspired by a memorable brunch I had a couple months ago at a tiny neighborhood restaurant, The Sudra, in SE Portland. The Sudra is beloved for its vegan, deeply spiced Indian cuisine. Black rice has a rich, nutty flavor, chewy texture, and powerful color, while sautéed apples spiked with cinnamon and cardamom take on a beautiful crimson hue, making this bowl impressive enough to serve for weekend brunch. You can use any type of milk, but for a creamy treat I recommend making it with rich coconut milk. Unsweetened canned coconut milk is available at most grocery stores. To be able to prepare this breakfast in less than 15 minutes, cook the rice the night before while you’re cleaning up from dinner. In a medium pot over high heat, bring 2 cups of water to a boil. Add the rice, cover, reduce the heat to low, and simmer for 20 to 25 minutes or until the rice is cooked through but still chewy. Drain the rice. If you cooked the rice in advance, allow it to cool then store in the fridge until ready to use. Heat the oil in a large saucepan over medium heat. Add the apples and cook until they begin to soften, stirring frequently, about 5 minutes. Add the cinnamon, cardamom, if using, and salt and cook for an additional minute being careful not to allow the cinnamon to burn. Add the milk, honey, and cooked rice, and heat just until warm. Divide the Black Rice Porridge amongst 4 bowls. Top each bowl with a handful of chopped nuts, coconut flakes and/or dates and a drizzle of honey, if desired, and serve. To toast coconut: Preheat the oven to 350°F and spread the coconut out on a baking sheet. Bake for 4 to 5 minutes, or until golden, stirring halfway through (keep a close eye on it to prevent burning).